Bay laurel, also known as bay leaf, is a common spice in many Mediterranean dishes, but its long medicinal history is often forgotten or overlooked in modern times. Holding great import in Greek and Roman mythology, bay laurel was a symbol of the gods of medicine, thought to have protective, healing powers. It was also used in these ancient cultures for divination purposes and as a decorative garland during festivals for athletes – giving rise to the term "resting on one's laurels" - a saying that refers to people who stop striving because they are content with past achievements. These holy connotations remained with the herb well through the beginnings of Christianity and up until the 18th century, when it became common practice in England to scatter the leaves on the floors of distinguished houses. It was around this time that culinary use also became more usual. Relieving gastrointestinal discomfort. Bay laurel has been shown to settle the stomach by reducing contractions of the intestinal muscle, being particularly helpful for treating diarrhea. Treating coughs. Bay laurel as been used for long as a remedy to help break down mucus. Bay laurel leaves contain volatile oil that is comprised of several different micronutrients, including tannins and resin. In addition, terpenes - namely cineole - are present. 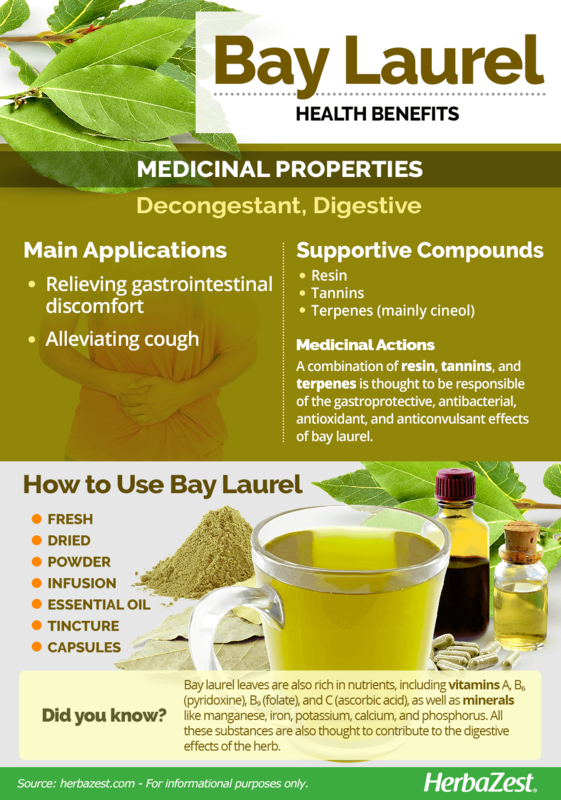 It has been shown that bay laurel leaf extracts have gastroprotective, antibacterial, antioxidant, and anticonvulsant effects, which are attributed to the presence of terpenes; however, further research is necessary to corroborate this claim. The leaves also contain a vast amount of nutrients, including vitamins A, B₆ (pyridoxine), B₉ (folate), and C (ascorbic acid), as well as minerals like manganese, iron, potassium, calcium, and phosphorus. All this substances are also thought to contribute to the digestive effects of the herb. Bay laurel can improve digestion by aiding in the break down and absorption of food. Similar decongestant properties can be found in eucalyptus and myrtle, whereas dill and fennel also help improve digestion. Bay laurel is mostly safe for consumption. However, bay laurel's essential oil should never be consumed orally due to risk of toxicity. Likewise, sensitive individuals may experience an allergic reaction, usually manifested as a general skin irritation following topical application of bay laurel's oil, so it must always be properly diluted. Though it is more commonly used for culinary purposes, the best way of reaping the health benefits of bay laurel, or bay leaf, is through medicinal preparations. Raw. In certain dishes like stews and meats, a couple of fresh or dried bay leaves are added for flavor. When used in this way, bay is said to help in the digestion process. Infusion. A warm infusion of bay laurel leaves can soothe stomach discomfort and aid digestion. Essential oil. Traditionally, bay leaf essential oil is properly diluted to 2% in a carrier oil and then rubbed on aching joints and muscles. It is also used in aromatherapy. Due to its toxicity, bay laurel oil should not be ingested. Tincture. A concentrated form of the herb that is obtained by submerging the crushed leaves in a neutral alcohol. This solution should be diluted in a glass of warm water in order to alleviate indigestion. Capsules. While uncommon, capsules filled with dried, powdered bay laurel can be taken as a supplement. Fresh bay laurel is picked year-round in its temperate zones of growth, and thus supplies are almost always available in grocery stores and supermarkets. Dried leaves can be found in similar locations, both whole and ground into a powder. Tea variations are more frequently available in health food stores. Essential oil is more common, and sometimes can be found in health food stores, but remedies and capsules featuring the herb are also available via online retailers. Bay Laurel (Laurus nobilis) is an evergreen shrub that thrives in a wide range of conditions. Because of its hardy nature and ornamental appeal, bay laurel is a common sight in landscapes and home gardens. Bay laurel is considered one of the hardier herbs, surviving in almost any type of soil and all but severe winter temperatures below 23°F (-5°C) and harsh maritime winds. Partial shade is ideal, and a controlled-release fertilizer is also recommended to accelerate growth. It may take seeds up to six months to propagate after an early-autumn planting, but mature side-shoots can be cut and used early on. The plant itself is highly resistant to disease. If seeds are required, both male and female plants must be grown. Standing up to 70 feet (20 m) tall, bay laurel is deciduous tree that features leathery, dark green leaves and small, yellowish white flowers that grow in clusters. On female specimens, these flowers later turn into black, shiny berries resembling olives. Leaves contain the majority of its applicable value and are the most widely used part of the plant. A member of Lauraceae, or the laurel family, Laurus nobilis, also known as bay laurel, sweet laurel, Indian bay, laurel tree, among other names, is one of over 3,000 species of flowering plants in this group, including cinnamon (Cinnamomum verum) and avocado (Persea americana). There are many cultivars of bay laurel; however, among the most well-known varieties are L. nobilis var. angustifolia, or narrow-leaved bay, with long, narrow, and lustrous dark green leaves, which is hardy in cooler regions; and L. nobilis var. aurea, or golden bay, with yellow-gold foliage that fades in color during the summer and it is highly valued as an ornamental shrub. Bay laurel may have transitioned in chief importance over the years from herbal medicine to culinary seasoning, but its cultivation still represents a major part of the agricultural crop industry in many countries - particularly Turkey, which leads production, providing 90% of the world's supply. In 2011, the nation generated over 8,900 tons of the herb totaling approximately $26,000 USD. Its value is expected to continuing rising in the future. The United States, Hong Kong, and Brazil import the largest quantity, but its value as an ornamental plant reaches across the globe. Gardening. Because of its fragrant scent and herbal possibilities, bay laurel has become a well-beloved ornamental plant around the world, growing with tolerable success in a wide range of zones. Cosmetics. Its essential oil is sometimes used in the aesthetics industry, appearing in both soaps and perfumes in combination with other aromas. Insecticide. 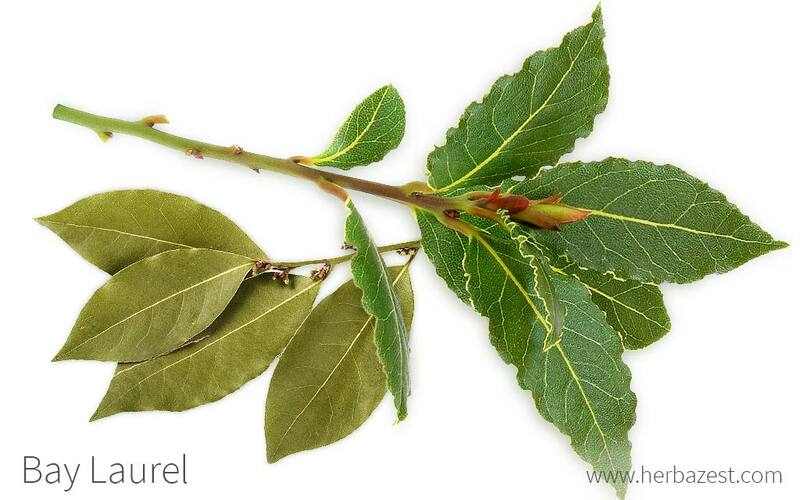 Bay laurel's essential oil makes a powerful insect repellent. Carpentry. Historically, the wood of the tree can additionally be carved into walking sticks and other small articles, valued for their durability.